After what can be described as a very public “false start”, Eduard’s 1:48 Bf 109Gs reemerged as superb kits that could claim the crown as the best Gustavs currently available. So I was very keen to see how Eduard tackled its full-size predecessor - the Friedrich. 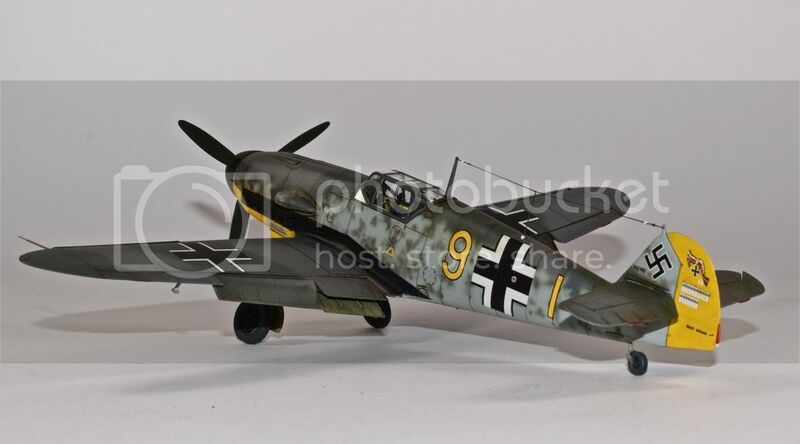 The first to appear in what will surely be a series of variants is the Bf 109F-4, reckoned by many to represent the highest point in the development of the ‘109 - where the airframe reached its full potential and before it was encumbered by ever more add-ons that steadily undermined its handling in an effort to keep pace with later designs. Eduard’s new Friedrich enters the market as a ProfiPack edition, combining styrene parts with etched accessories and painting masks to provide a very complete package at an affordable price. 80 parts unused? That’s a heck of a lot destined for the bin or (more hopefully) the spares box! The reason for the high number is that Eduard have included included two of the original sprues from the Gustav kits, and moulded two new ones for the fuselage and wings, along with a fresh set of clear parts. Even here there’s a slight mystery, though, because the new fuselage sprue still includes the original tail parts and Beule from the Gustav (in fact, until I looked closer, I was worried the sample kit had arrived with a Bf 109G sprue by mistake). No doubt there’s economic reasons behind the decision to put changed parts on an existing sprue layout, even if it does seem counter-intuitive to the layman. 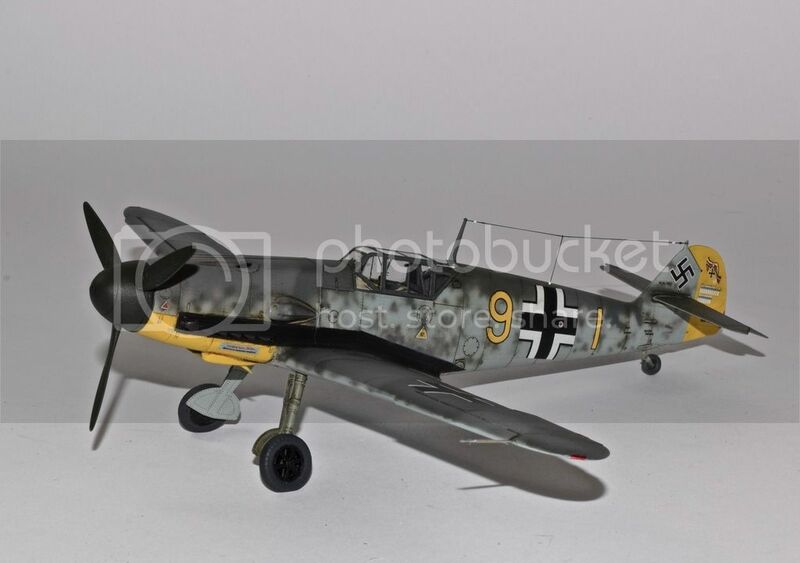 Rather than slavishly go over the same ground as in the Bf 109G-6 Late Series (reviewed HERE), I'll focus on the new parts specific to the Bf 109F. The fuselage has undergone a major transformation in how it’s designed. The fin is now moulded complete (there’s no need to allow for the later “tall tail” anymore), and the nose no longer has the separate top decking that followed a panel line on the Gustav. With the Friedrich, you just have separate inserts for the MG 17 troughs. The fuel filler point has been revised, so there’s no need for any scribing or filling (as in Hasegawa's range of mid- and late-model '109s) and, should you need them, the strengthening fishplates for the tail are provided as etched items. With the wings, you now have fully round wheel wells, and no bulges on the upper surface. In terms of construction, they are the same as before, and I have to say I wish Eduard had taken the opportunity to provide the pitot tube as a separate part, because it’s just asking to get damaged during construction as it’s moulded. Similarly, I still think it would be nice to have clear inserts for the wingtip lamps, but these are minor gripes in a superb kit. The existing sprues provide the early-style spoked wheels and slim-bladed propeller, and this time the bomb is used, complete with etched fins and brackets for a true-to-scale look. There's a tropical filter provided with etched grills, and Eduard have spotted the small slip-up they made in the Bf 109G-6 by including etched parts for the slide-moulded exhausts on both sides. Talking of the etched parts, the way the pre-coloured seat harness is done is different to Eduard's previous releases that I've seen, and there's shading on the straps to give extra depth and a worn look. A new clear sprue features the earlier style canopy with its lighter framing and diagonal windows below the windscreen. A separate armoured windscreen is provided and the overall quality is fantastic, without a blemish on the crystal clear parts. The sliding panels on the main canopy are represented, but one point Eduard have missed is the small ventilator in the roof of the windscreen section. Sticklers shouldn’t find that too hard to add - in fact, you could just cut a small notch in the very handing kabuki painting masks that are provided to give a passable effect. The instructions are presented in colour on glossy paper as a 20-page A4 booklet. Construction is broken down into logical and manageable chunks (the stages aren't numbered), and follow very much the same format as the earlier Gustav. Certainly, when I built the Late-Series 'G-6, I hit no problems, so I don't anticpate any here. The only points I had to watch out for were the afore-mentioned pitot tube, plus the radiator flaps that proved prone to taking knocks during assembly. Colours are keyed to Gunze Sangyo paints throughout, and RLM codes are included so you can source other matches if you prefer. Decals are included for 6 aircraft, with an interesting selection giving a good variety of camouflage options, from standard European, through winter and desert schemes, to field-applied Eastern Front patterns. The decals are printed by Eduard themselves on two sheets and look excellent quality, with spot-on registration on the sample sheets, with the thin, glossy items showing minimal carrier film. The first sheet provides personal and national markings, including swastikas (whole and halved to please censors), and a really nice touch is the pair of "damaged" wing crosses for Marseille's aircraft. As an alternative to the etched instrument panel, there's a very crisply printed set of instrument bezels which you could always apply separately if you have a punch and die. A separate sheet provides a comprehensive set of servicing stencils, with a choice of black or red for many items. A full page diagram shows the placement of all the items, but you'll have to decide for yourself which colour to opt for. The new Bf 109F-4 looks to be another excellent release from Eduard, and I'm really looking forward to getting started on a full build. It's packed with detail to satisfy experienced modellers, but also (based on the Gustav) should be pretty straightforward to build. Highly recommended. Highs: Excellent moulding and beautifully detailed. High quality decals for 6 aircraft. Lows: None really, although clear wingtip lamp covers would still be the icing on the cake for me. Verdict: Eduard's new Friedrich looks a real beauty, building on the success of their retooled Gustavs to provide a real alternative to Zvezda's acclaimed kits. Actually there are some issues in this kit, and the most noticeable is badly oversized exhaust pipes and openings for them. The one from Zvezda is still the best on the market. Sergey. Rowan, by now you should know that i am bashful!